Science and society have been codependently constructed. 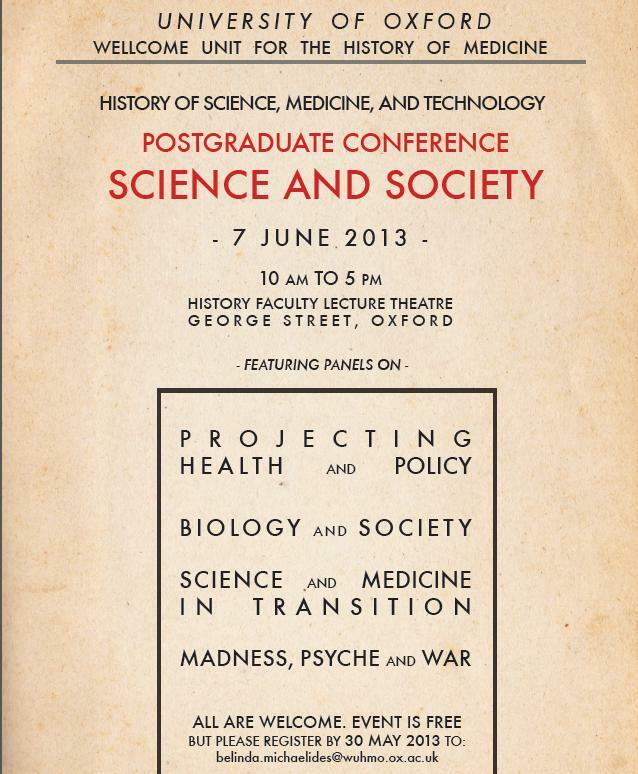 The Wellcome Unit’s annual postgraduate conference seeks to explore these conceptual intersection points through panels ranging in subject matter from “Projecting Health and Policy”, “Biology and Society”, to “Science and Medicine in Transition”, and “Madness, Psyche, and War”. Bringing together a variety of explorations of the histories of science, medicine, and their broader influences, the conference seeks engaging and enthusiastic participants in a rousing and challenging discussion. This entry was posted in News, Talks & events and tagged conference, postgraduate, WUHMO on 23 May 2013 by .